Dethleffs - That means over 75 years of extraordinary development and trendsetting ideas all implemented for the benefit of our very valuable customers - always bearing in mind our philosophy 'A Friend of the Family'. This idea is unique for the industry and explains the great popularity of the brand Dethleffs for over 75 years now. Also this year we have many innovative highlights and new ideas in our model range, which we are sure will enhance your experience and increase your overall pleasure with a Dethleffs vehicle. Enjoy your discovery of the 2009 world of Dethleffs Online. At Dethleffs 14 employees are dealing with the order proceeding and the deliveries. This starts with the order put in by the dealer. After production the department is coming into play again, issuing the delivery papers and eventual customs documents in order to prepare everything for delivery. Another important task is the receiving of the chassis, and that means intense activity on many days of the year: every day arrive up to 220 chassis. Main task of this department is to ensure efficient service to our customers, which means in the first instance the Dethleffs dealers. The try to find the optimal financing solution, in order to ensure long-term business cooperations. From this activity then Dethleffs owners will benefit, either due to a representative demonstration program or due to reliable contact persons for many years. Our vehicles are composed of hundreds and thousands different parts and fittings. 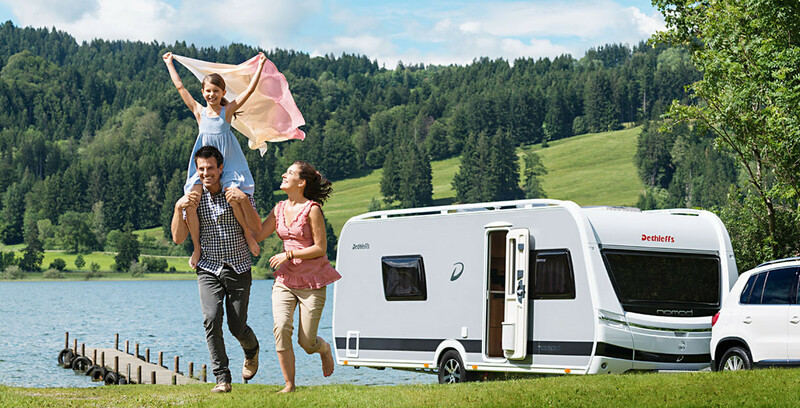 Most of those parts are produced by sub-suppliers for a simple reason: suppliers are specialised in certain domains and we highly benefit from their competence in order to produce the perfect caravan or motorhome. The purchase department is responsible for choosing the best suppliers, negociating prices and contracts. The team headed by Mr Reger is purchasing approx. 11.000 different parts - to run from simple screws to whole chassis. Our workshop team is working alongside the after sales team, the spare part department and suppliers as e.g. Truma, Electrolux or Thetford. They are specalised on repairs, which are especially tricky. On 950 m² the team which is managed by Mr Dorn are repairing damages caused by accidents, carrying out retro-fitting of options or dealing with warranty issues. Furthermore the team is in dialogue with our technical department in order to constantly improve our production. On a regular basis the workshop team is offering training courses for their colleagues from the dealerships. They are working behind the scenes but are making an important contribution to achieve customer satisfaction. The team headed by Mr Sauter are looking after more than 300 dealers all over Europe in order to assist them in technical issues. This requires a technical knowledge of not only the actual range but also of vehicles of earlier production. Furthermore the After Sales Team attend numerous Dethleffs events in order to consult our customers and gain experience, new ideas and suggestions of our Dethleffs customers.